The 14 tallest mountains on earth are collectively referred to as the "eight-thousanders" because each stands at over 8,000 meters (26,247 feet) tall. All of the eight-thousanders are located in Asia's Himalayas and the Karakoram mountain ranges. The Karakoram range separates India, China, and Pakistan. Read about traveling to Nepal to see many of the eight-thousanders for yourself. While China suggested additions to the list of eight-thousanders in 2012, these peaks over 26,247 feet are the ones officially recognized by the world community. Mount Everest: 8,848 meters (29,029 feet); located between China and Nepal. 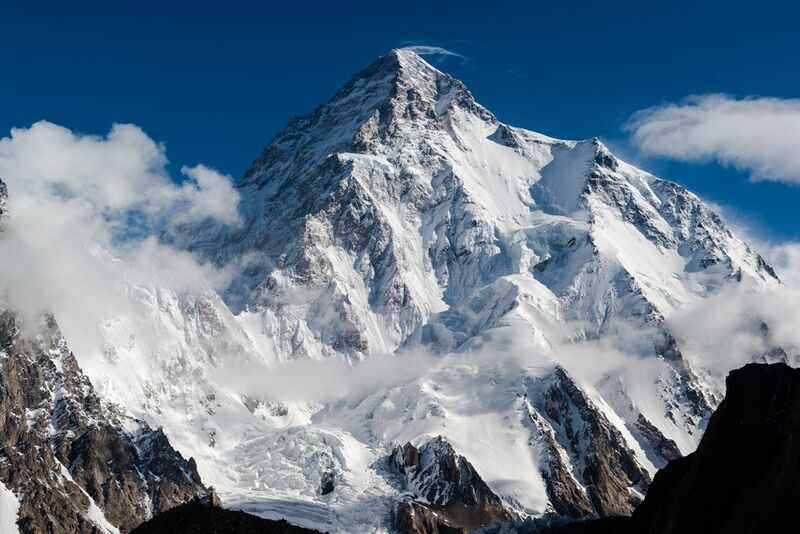 K2: 8,611 meters (28,251 feet); located between Pakistan and China. Kangchenjunga: 8,586 meters (28,169 feet); located between Nepal and India. Lhotse: 8,516 meters (27,940 feet); located between China and Nepal. Makalu: 8,485 meters (27,838 feet); located between China and Nepal. Cho Oyu: 8,201 meters (26,906 feet); located between China and Nepal. Dhaulagiri I: 8,167 meters (26,795 feet); located in Nepal. Manaslu: 8,163 meters (26,781 feet); located in Nepal. Nanga Parbat: 8,126 meters (26,660 feet); located in Pakistan. Annapurna I: 8,091 meters (26,545 feet); located in Nepal. Gasherbrum I: 8,080 meters (26,444 feet); located between China and Pakistan. Broad Peak: 8,051 meters (26,414 feet); located between China and Pakistan. Gasherbrum II: 8,034 meters (26,358 feet); located between China and Pakistan. Shishapangma: 8,027 meters (26,335 feet); located in China. Asia's monster mountain range is the highest on earth by a long shot. The Himalayas span or border six countries: China, India, Nepal, Pakistan, Bhutan, and Afghanistan. With Mount Everest, the eight-thousanders, and over 100 mountains that rise above 7,200 meters (23,600 feet), the Himalayas are a wonderland for serious mountaineers. The highest peak outside of Asia is Aconcagua in Argentina with a peak of 6,960 meters (22,837 feet). Aconcagua is one of the Seven Summits -- the tallest mountains on each continent. King of the eight-thousanders, perhaps no other mountain on earth receives as much press as the notorious Mount Everest. Oddly enough, Mount Everest may be the tallest mountain in the world based on measurement to sea level, however, it is not the most difficult or dangerous to climb. As of 2016, more than 250 people have died trying to summit Mount Everest. Although the fatality rate is only around 4.3 deaths per 100 climbers -- relatively low when compared to the 38% fatality rate on Annapurna I -- the popularity of the mountain and volume of summit attempts have given it the reputation as being the deadliest. Mount Everest stands in the Himalayas between Tibet and Nepal. But as famous as Mount Everest has become, it actually isn't a very prominent mountain. Many first-time trekkers in Nepal aren't sure which in the surrounding range is Mount Everest until someone points it out! See where is Mount Everest and learn some surprising facts about the mountain. An amazingly dangerous feat, credit is given to Italian Reinhold Messner for being the first person to successfully summit all 14 of the eight-thousanders; he did so without the aid of oxygen bottles. He was also the first climber to ascend Mount Everest without supplemental oxygen. Messner published, among many other books, his memoirs in All 14 Eight-Thousanders. As of 2015, only 33 people have successfully climbed all 14 eight-thousanders, although a few other climbers have made disputed claims that were not yet verified. If climbing the earth's 14 tallest mountains wasn't enough of a feat, mountaineers are pushing the limits by attempting the summits without oxygen. Austrian mountaineer Gerlinde Kaltenbrunner became the first woman to climb all 14 eight-thousanders without the use of supplemental oxygen. A few mountaineers have joined the elite minority who prefer to climb in winter. So far, only K2 (between Pakistan and China) and Nanga Parbat (in Pakistan) have yet to be summited in the winter months. In 2013, Broad Peak (between Pakistan and China) was finally summited during winter. With a fatality rate of around 38% (more than one in three climbers perish), Annapurna I in Nepal holds the ominous title as being the most dangerous mountain on earth. K2 comes in second with a fatality rate of around 23% (more than one in five climbers perish). Although actually climbing the world's tallest peaks may be out of reach for many of us, the trekking near the mountains offers incredible views without the dangers of a summit attempt. Treks can be organized either before you leave home or once on the ground at various agencies in the country. The stunning Annapurna circuit in Nepal can be broken into segments or completed in two to three weeks. The famous trek to Everest Base Camp in Nepal can be completed by anyone reasonably fit without gear or technical training. Here are 7 things you probably didn't know about Mt. Everest. What on Earth Is Eartha?